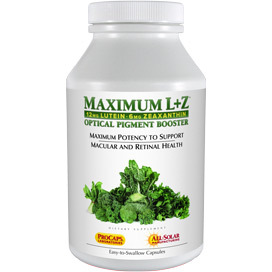 MAXIMUM L+Z is an ultra-high potency blend of Lutein and Zeaxanthin (L + Z), two dietary ingredients that physicians and experts consider to be critical for eye health. Diets rich in L + Z have long been associated with superior vision and eye health. L + Z are most highly concentrated in the retina and macula of the eye where their unique molecular structure allows them to protect these delicate tissues from high-energy radiation and oxidation. Their concentration in the macula is so high that they provide both its color and its name, since in Latin the macula is called the macula lutea or yellow spot. L + Z are also referred to as “Optical Pigments,” since they also play a key role in the eye's visual systems promoting visual acuity (sharpness of vision), as well as visual processing speed. 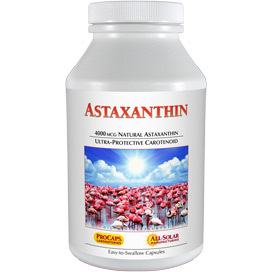 Zeaxanthin also affords enhanced protection to the macula due to extremely high concentrations at the center of the retina. In short, L + Z are at the top of any list of dietary ingredients that protect our eyes from a lifetime of normal age-related changes. L + Z also protect the skin, but it is the brain where substantial recent research has shown Lutein to be associated with superior cognitive function, memory and verbal fluency with age. The body cannot make L + Z and the typical American diet provides so little that supplementation remains the only viable option of ensuring the vital protection these critical nutrients provide to our eyes, brain and skin. Consume one or more capsules daily or as recommended by a health care professional. Since Lutein and Zeaxanthin are fat soluble, they are best absorbed when consumed with foods or meals containing a small amount of fat or oil. As with any dietary supplement, this product is most effective when used as part of a healthy diet and active lifestyle, along with a daily multi-vitamin-mineral formula.